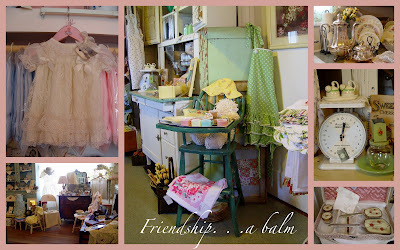 Are there ever times in your life that you just need a break, the kind where a visit with a friend is a balm? It's during those times that friends are especially meaningful and precious. Yesterday I had the opportunity to visit my friend, Paula, and we had a wonderful chat. It was so much fun seeing the new things she had added to her shop. We walked around, looking at some of her new displays. She shared ideas and stories of the new things on her shelves. A conversation about our families and simply getting caught up with one another was so much fun. How special it is to have a friend with young adults in her family, like I do. Sharing the little things, experiences in daily life is sweet and such a stress reliever in the midst of a busy week. Thank you, Paula, for a really fun afternoon! "A happy woman is one who has no cares at all; a cheerful woman is one who has cares but doesn't let them get her down." I have a friendship like that as well. Such a blessing it is! Love the quote and words about Paula. The collage is fun too. I am beginning to feel overwhelmed with all I need to do to be ready in less than 2 weeks now. Somehow it will come together. What would we do without those special friendships? I'd be a mess! I'm glad your visit with Paula brightened your week. The quote is perfect.